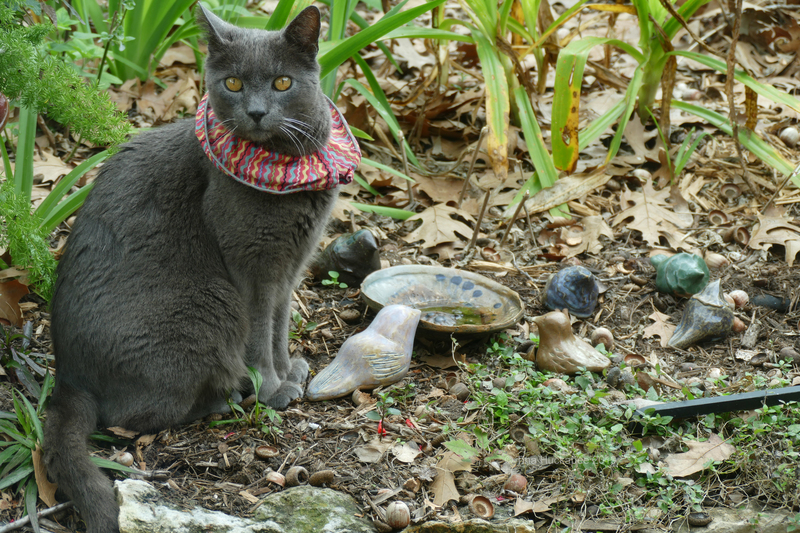 This entry was posted in Biodiversity, Insvasive species, Uncategorized and tagged BirdsBeSafe collars, Widlife gardening, Wildlife Wednesday by Tina. Bookmark the permalink. 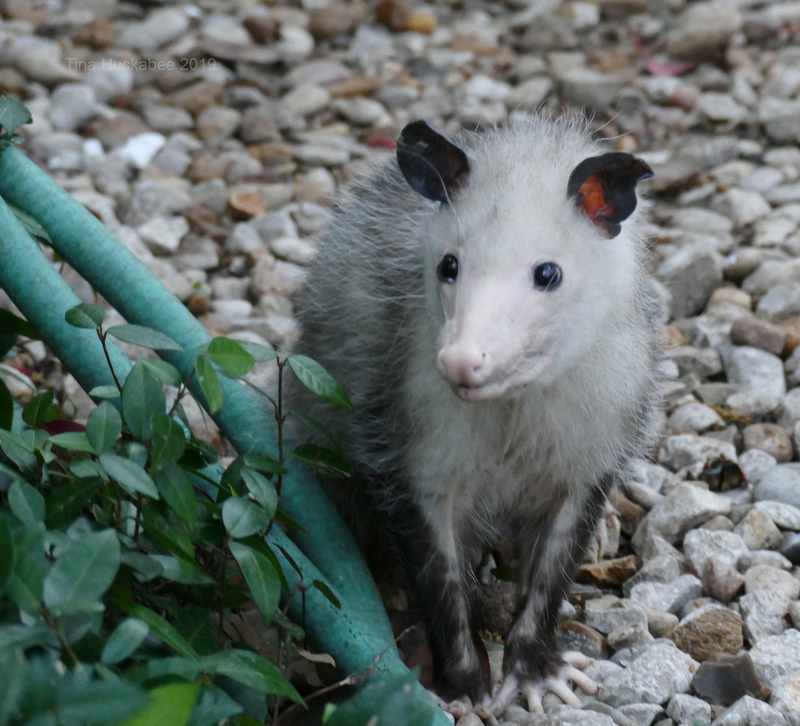 Don’t forget that opossums do not get rabies….something to do with their body temperature….and they eat ticks…..so very desirable in the garden. 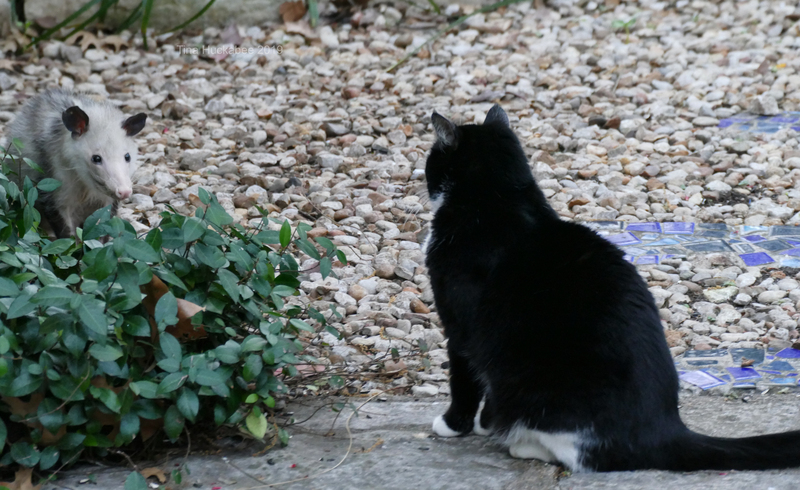 My two lady cats go briefly into the garden each day but don’t bother the birds, are wary of the squirrels (which are mostly bigger than they are) but have caught the occasional lizard…but softmouthed, so that I have been able to free the little critters. The hawks, on the other hand, kill both birds and squirrels in my yard. Opossums have a body temperature of about 94 degrees–too cold for the rabies virus to survive. They can get rabies if bitten on the face or neck because it would be near the brain stem, but that’s about the only way. Yes–they eat ticks–Yay! Hawks are part of the natural cycle; I don’t begrudge that at all. I can’t believe you got that picture. I love to watch wild baby animals because they have not figured it all out yet. I recently came across the stats for cats. My cat is indoors, but my neighbors cats have taken birds and rabbits from my yard. I guess all I can say is that opossums are much slower than either bees or birds, so a decent photo is much more easily attained. 🙂 I agree that the opossum is young; I think it lives in a neighbor’s shed, just behind me. Good for you for keeping your cats indoors–we’re working on it and I also have more problems with neighbors’ cats. I admire how you have adapted your way of thinking. I admit to having some pretty ragey feelings towards my neighbourhood outdoor cat owners, but feel powerless to do anything about it. It’s encouraging that you are open minded enough to change, something that can be very hard. I love possums! They are rare in my neck of the woods, but I find them cute. I also hear they are great tick eaters and do not carry rabies. I know lots of people who just love opossums. Babies are actually really darling and yes to the tick eating and the no rabies. Win! Great shot of that opossum. 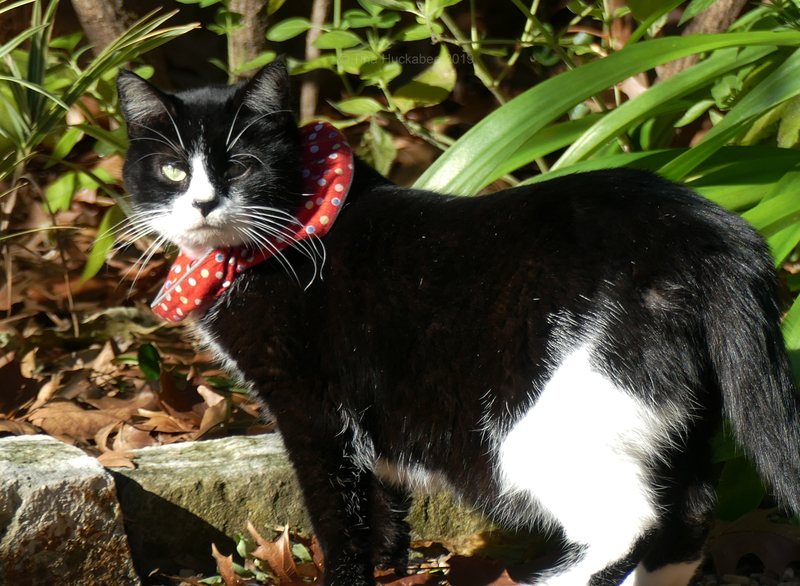 But those adorable cats in their collars – SO handsome! Good information about the BBS collars. And a great point about who the invaders are – and don’t we humans win top prize in that category?! We have 3 cats,they go outside for a bit of sun and “smellivision” on the back patio but only under constant supervision. If they start to stalk anything, back inside they go – we aren’t taking any chances. Anyone who feels conflicted about keeping a cat indoors should check with their vet and I’m guessing they’ll quickly be dissuaded from any idea they are depriving their felines. Thanks–the shot really was an easy one; I love things that don’t flit away! Yes, we humans are quite the scourge in the world! I do pretty much what you’re describing for my two cats and yes, I think most cat experts agree that they’re (and everyone else) are better off indoors. Haha. I have no idea is the opossum is actually sweet, but he/she certainly is shy. I’m sure it lives in/around/or under my neighbor’s shed and I don’t mind its visits to my garden. I’m glad the cats have the collars, but I still keep a wary eye on them! How lovely to have opossums in the garden. Much nicer than cats. It is heartening to read about responsible cat owning. In the UK, cats kill 27 million birds a year. It is a constant worry at this time of the year with three cats from nearby houses patrolling the garden. Vulnerable baby birds will be around soon. And apart from the birds, they look upon my raised veg beds as giant sand boxes to do their business in. It’s amazing that there are any birds left! I know what you mean about having cats in the garden, they are dangerous for wildlife. Hopefully, we can keep them from catching the little fledlings–they deserve a chance for a good bird life. As well, that whole garden-as-litterbox thing is very annoying. Monarchs are back along with a few other wildlife sightings. As for the cat, we’re working on it. We never intended to have a cat (outdoors or in) but she adopted us and it’s not an easy situation. I remember you’ve talked about that cat! It isn’t an easy situation and cats are predators–neither intrinsically good nor bad, it’s just what they are. My wild critters currently consist of hundreds (yes, hundreds) of snails. Our cat, who is now 17 years old, only spent time as an indoor/outdoor cat twice. His first home, where he was abandoned or left behind, made him an outdoor cat. We kept him inside upon adoption as we lived in an apartment on a very busy street. He remained indoor until a few years later when we managed to move into a place that wasn’t on a busy street. He would come home with tufts of fur and specks of blood, neither his, on occasion. He’s been only inside the last 13 years or so but still loves to sniff at an open window. Our dog loves to chase squirrels. He’s far too large, loud, and slow to catch anything. I’ve had a soft spot for opossums as we had an amazing teacher in second grade and one of the amazing things he did was have a woman bring in a litter of baby opossums she’d rescued for us to learn about (including to never touch a wild one.) I’ve always thought they were cute. Sounds like your kitty has lived a good life, especially once she found you. 🙂 I volunteer at Austin Wildlife Rescue and just yesterday, fed Pedialyte and some meds to baby opossums. I’m in the “meh” category about their looks, but the babies are really darling–not lots of personality, but really cute. Here’s a cat problem directly caused by irresponsible people, and that’s feral communities of cats who have been dumped – almost never spayed or neutered and sometimes pregnant – with no access to food or water, often in extreme temperatures. Terrible suffering! The ones that do manage to survive do so, I am assuming, by eating small mammals and insects. A few find each other and form colonies in which they continue to breed. They are not suitable for adoption but they are still living beings, on their own through no fault of their own, and I can’t in good conscience deliver them to be destroyed. I don’t know how to solve the people problems of irresponsibility and just plain cruelty, but if the cats show up at my house – and somehow they so often do; I must be a cat magnet – they get live trapped, taken to a rescue organization vet or an individual vet who deals with ferals, and they get what they need, plus neutered or spayed. Then I provide food, water & shelter in the form of a dry shed with beds & heated in winter, where they are free to come and go as they please. My hope is that this cuts down dramatically on any wildlife they may kill for survival. It’s not a perfect solution but it’s a small incursion into a small part of the problem and, thankfully, I’m nowhere near alone in caring for a colony or two. Now, if we could only get those people to stop reproducing both their behavior & their callous mindset … problem solved! Some people should never, ever be around animals, IMO. It sounds like you’re improving a bad situation. It isn’t the cats’ fault that they’re homeless or that they produce litters–that’s squarely on human irresponsibility–so thank you for taking care of them. I’ll be the first to tell you that I’m a hypocrite, too. Our old cat reigned supreme in his neighborhood, and always watched the going-ons from the top of our car. And yes, he would catch the occasional critter, and I felt bad almost every time. The one we recently adopted from our neighbors, is more of an indoor cat. He goes out a little here and there, but hasn’t shown nearly the same kind of need for the outdoors as our dear Manneman. I love the photo of the Possum, and the one of the stare-down. I may be in the minority, but I think they are adorable! We’ve all been there…. I’m glad you have a new cat in your life and I’m glad he’s mostly wanting to be indoors. It’s a hard one because cats like to be out, and it’s easy for us to let them out, but it’s just so much better if they’re in. Baby opossums are darling (see my response above) and they’re interesting critters–I don’t mind them one bit! A peeing-in-the-house cat is no fun, to be sure. I imagine you’re right though, that he’s traumatized by his family’s departure. I hope he can settle in. My Nuri is having a few issues in that direction, but it’s more about one of his heart meds and so far, it’s not been much of a problem. I never knew we had a possum until one day last spring when the bathroom remodeling crew was taking a lunch break on the front porch and saw a baby possum emerge from under a small yew hedge. A moment later the mother possum came out and retrieved it, heading back into concealment. One of the crew took some pictures with his phone to show me. Never seen a possum here before or since. What I do see are gray squirrels (always), rabbits and chipmunks (occasionally), voles (always deceased), and Sheldon the neighborhood Moocher Cat. Mice are definitely around. I know there are rats as well but thankfully have not seen one firsthand yet. I’m sure you have more than that one around, but they’re shy about being seen. We don’t have either chipmunks or voles, but we do have our share of Moocher Cats. And rats. There are always rats. First, an almost completely unrelated comment: your cat’s name, Astrud, is only the second time in my life I’ve known someone to have that name. The other was Astrud Gilberto. I’ve not thought of her in years, and now I’m listening to her music, with pleasure. I may have mentioned that an adult possum and I came together at the bottom of my steps recently. It’s toothy fear response wasn’t pretty, but we backed off from each other, and all was well. I think they are cute, and it pains me that so many end up as roadkill. As for the cats: yes. Dixie Rose always was an indoor cat. She had a chair next to a window where she could watch the birds at the water bowl, and such chattering you’ve never heard. But even when the window was open, she never attempted to go through the screen, and the birds soon figured out that she wasn’t a real threat. Unfortunately, I have a cat lady for a friend. She lives in the country, and has so many cats roaming around I’m embarassed to even tell the number here. We’ve talked about it, and she traps from time to time, but I don’t think she’ll ever get rid of them all. Since she’s in her 90s, the problem may be self-limiting. It’s strange, because she’s quite a bird fancier, too. Sometimes, rationality just doesn’t cut it when trying to deal with these issues. You were wise to keep Dixie Rose indoors. I wish that I’d stuck to my kitty guns with Nuri, though he hasn’t been too hard on wildlife. “Toothy” is a good description. I volunteer at Austin Wildlife Rescue and even the babies open their mouths and show their teeth. When I was last there, two adults were recuperating from injuries probably caused by a car. One was a mother with babies. Wow–90 years old and still hanging with cats! You’re right, of course, rationality isn’t really the issue here…. This is not in my garden, but is in western San Jose a few miles away. Opossums are VERY common in parts of Beverly Hills (in the Los Angeles region) but not in others. It took me a while to figure out that they were common in the same places where rats are more of a problem. I do not like encountering them out and about, but I do happen to approve of their work there. The few who live here take a bit of the fruit, but they tend to eat one fruit at a time, rather than taking a bite out of each one. In that regard, I do not mind sharing. The few apples, figs or whatever they want are worth their diligence at keeping rats out of the same fruit. Unfortunately, they do not keep raccoons or deer away, and the raccoons are really nasty and belligerent. I do not know if skunks take fruit or vegetables, but it they do, they do not take much. They seem to be satisfied with taking the snails, slugs and grubs, which is just fine with me. For that work, they can take all the fruit and vegetables they want. Bobcats get enough mice, rats and rabbits to bother with the opossums, raccoons or skunks. Mountain lions primarily eat dear. I don’t watch Southpark, but my son did when he was in highschool. I agree that mostly, I’m fine with the work that opossums do. They’re harmless and just want to be left alone and that’s fine with me. I also agree that raccoons–while really adorable, especially as babies–can definitely be nasty. Thanks for the tip about the collar. Our last cat was a voracious hunter – voles, mice, rabbits, birds, small dogs (just kidding) – no creature was safe. And it was impossible to keep her inside. After we retire we’re thinking we’ll get another kitty or two, and try again to keep them is inside cats. Incidentally, I like Opossums. Did you know they eat ticks in addition to rats? Judy finds them repulsive, though. You’re welcome. It’s not a complete fix, but I think the birds at least are more aware when the cats are out. I’ve never really owned a super-duper hunter. They’ve all hunted a little, few have specialized in birds. My Nuri (the grey guy) was a great ratter in his youth–no complaints there. I do know about the tick eating! I don’t mind them, but I’m with Judy, I think they’re rather unattractive. Very unattractive. I think it’s partly that naked tail–I like mammals to have some fur there. The babies are quite cute, though.